This easy Easter table decorating idea makes a good last-minute Easter centerpiece. I created it with some leftover food dye and two little bags of Easter chocolates. Fill each glass about 1/3 with tap water. Add liquid food dye until you have achieved the depth of color you want. 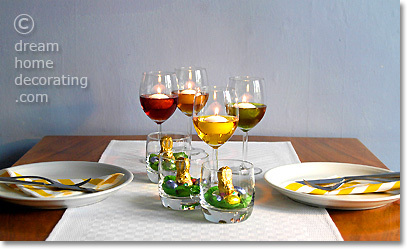 Alternatively, pre-mix the water & dye in another container and then pour into the wine glasses. Scrunch up a small amount of green tissue paper and cover the bottom of a glass with it. Fill Easter eggs into the glass and set an Easter bunny into the center. Turn the glass around to check that the nest looks good from all sides. ... try creating an 'Easter bunny nest' in a footed bowl or a 'magnum' red wine glass - and then use the tumblers for the dye lights. Looks great, too! Return from Easy Easter Table Decorating to Easter Craft Ideas.